It's easy to switch your prescriptions to Eaton Apothecary ... we'll do it for you. All we need some information found on the label from your previous pharmacy. Simply bring the prescription container to your nearest Eaton Apothecary and we'll take care of the transfer with a telephone call. Assuming the other pharmacy is open and able to take our call, you can often wait for your prescription. If this is your first prescription with Eaton Apothecary, we will also need to see any prescription insurance cards you may have so that we can process your claim. 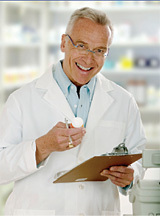 Depending on various state pharmacy regulations, most prescriptions with remaining refills can be transferred up to one year after the original date written. Prescriptions for controlled substances often have more strict regulations associated.